The Orange County International Auto Show, with the help of Motor Trend, delivers a family friendly and fun experience for all ages. Whether you want to drool over exotics or get bounced around on an indoor off-road track, the OC Auto Show has you covered. While over 150-test drives and plenty of supercars are more than enough to draw crowds of auto show attendees, Motor Trend helps to fulfill the enthusiasts’ curiosity just a bit more with their competitive test drives and annual vehicle rankings. 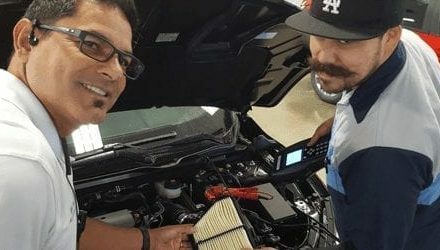 Motor Trend Features Editor, and panel judge for some of the publications top awards, Christian Seabaugh, joined us to share more details in this iDriveSoCal Podcast. Take your time, get here early, walk around, poke around cars. There’s also ride and drive experiences too, there’s a Ram 1500 experience where you can tow. There’s a Jeep off-road kinda course that you can take a Wrangler or a Cherokee or a Compass out on their little off-road course. 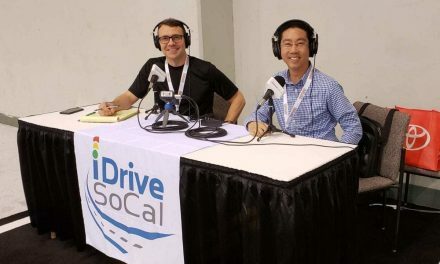 Tom Smith: Welcome to iDriveSoCal the podcast. All about mobility from the automotive capital of the United States, Southern California. Tom Smith here and I am joined by Christian Seabaugh of Motor Trend magazine. Now, he’s the features editor and if you hear the background noise, we are podcasting, live, if you will total oxymoron I think, but we are podcasting at the tail end of media day at the OC Auto Fair, OC Auto Show, excuse me. Tom Smith: Christian, thank you for joining me. Christian Seabaugh: Absolutely, thanks for having me. 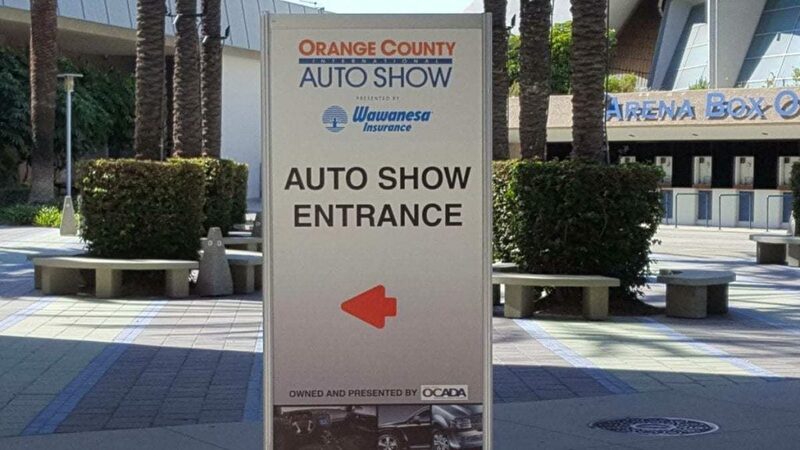 Tom Smith: So, the Orange County Auto Show is put on in collaboration with Motor Trend? Christian Seabaugh: Yep. And so we sponsor events all over the country and this just happens to be one of them and it’s close to home. Tom Smith: And it’s close to home for you? Christian Seabaugh: Mm-hmm (affirmative). Yeah, we’re based in El Segundo. Tom Smith: For Motor Trend overall? Christian Seabaugh: Motor Trend overall. The whole Motor Trend group is based in El Segundo, yeah. So we have HOT ROD they have Motor Trend, Super Street all those magazines and websites and our whole video on demand business too. Tom Smith: Video on demand? Tom Smith: Alright, alright. So you guys are, you guys are going pretty digital these days? Christian Seabaugh: Absolutely. Fully embracing digital. Tom Smith: Alright. And events? Tom Smith: Okay. So as the consumer coming to the OC Auto Show, what am I gonna experience here this year for 2018? Christian Seabaugh: Well, there are over 600 cars here. And it’s a great place to just get in and out of cars, poke around without the pressure of a dealership. Every year, for example, we do a car, truck and SUV Of the Year and one part of it is just getting in and out of cars, poking around, testing all the little features that you can and this gives you a little snippet of that experience. Tom Smith: Okay. And let’s talk about how you guys award your car, truck, and SUV Of the Year. First off, who does that? There’s a wizard behind the curtain that just blesses, right? Christian Seabaugh: No, actually we have up to 11 judges and we have six key criteria, engineering excellence, efficiency, performance of intended function, design, safety, and value. And a vehicle that doesn’t meet any of those one criteria, isn’t going to be in Of the Year winner. And so we gather up, just recently we were working on car Of the Year, we have 36 different cars and we test them over two days at Hyundai KIA proving grounds in California City. Tom Smith: Wait a minute, slow down. Tom Smith: Back that up, you take that where? Christian Seabaugh: To Tehachapi which is about 16 miles down the road, up in the mountains. Tom Smith: Of the Year loop? Christian Seabaugh: Yeah, that’s what we call it because we do SUV Of the Year, car Of the Year, truck Of the Year out there. Tom Smith: Okay. So, the overall mantle, right, if we’re gonna… we’re in Southern California, so we’ll put it in Hollywood terms. This would be the equivalent of movie Of the Year, right? Christian Seabaugh: Sure, yeah. Absolutely. Tom Smith: Right. But you have one for a car, SUV and truck? Christian Seabaugh: Absolutely, yeah. So unlike some other outlets who just pick their 10 favorite cars Of the Year or who would pick the most popular car Of the Year, we actually do the homework and test everything and figure out what deserves the Golden Calipers, which is our trophy. Tom Smith: It’s a good-looking trophy. Christian Seabaugh: It’s pretty cool. Tom Smith: Which is nearby in Southern California? Christian Seabaugh: Yeah, it’s in Tehachapi. So it’s two and a half hours away or so. Christian Seabaugh: Yeah. Never heard of it before I came out to Motor Trend. Tom Smith: Yeah, I’ve never heard of it either. I’ve been 12 years here, 13 years here in Southern California. Christian Seabaugh: Yeah, cute little town up at the edge of the Mojave North high desert. Tom Smith: Okay. And is the Of the Year Loop a stretch of drive that I can go on? Christian Seabaugh: Sure, anyone can go on it. We publish it in every Of the Year issue, so our January issue. Tom Smith: I guess I should brush up on my Motor Trend. Tom Smith: Shame on me. Christian Seabaugh: It’s totally fine. But yeah, it’s a great loop in that it gives you a little taste of everything. We get a little bit of urban driving, we get some steady state, really steep hill climbs, we get highway driving, there’s a really fun winding road. So we can literally test every single part of a vehicle’s dynamics capability on that loop. Tom Smith: Okay. And now as features editor, what do you get to do of all that? Christian Seabaugh: Well, with the Of the Years, I am a judge. Christian Seabaugh: So, I am one of the 11, typically helping make the decision. Christian Seabaugh: Yeah. And the rest Of the Year, I am putting together ridiculous ideas and doing road trips and that kind of thing. Tom Smith: Doing fun stuff. So how does one get your gig? Christian Seabaugh: I honestly don’t know. I had the journalism major in college and I got really lucky with getting a job at Motor Trend out of college, working on the daily news team. Christian Seabaugh: And I’ve been there for seven years now, working my way up. Test Drive sure… but Test Tow!?!? Tom Smith: Okay. Well good for you, that sounds like a lot of fun. Now, when is your Of the Year annualized? When are we … where are we in the stage? Are we announcing anything, here at the Orange County Auto Show? Christian Seabaugh: No, we are not, but we will be announcing something soon at the LA Auto Show, which I believe is next month. Tom Smith: Yes, it is. Yes, it is. Okay. Advice for those coming to the Orange County Auto Show in partnership with Motor Trend, here for 2018? Tom Smith: There’s a ride and drive where I get to tow? Christian Seabaugh: What are you gonna run into, a little fence? It’ll be fine, don’t worry about it. Tom Smith: Well it should be… you know what, there’s probably gonna be some great … you guys should have a blooper reel for that. Christian Seabaugh: I’m sure there will be one. Christian Seabaugh: Yeah, it’s gonna be cool. Tom Smith: I could only… I mean she wouldn’t even try to tow. That wouldn’t even be… now is it just towing forward or do you get to try to back something up? Christian Seabaugh: Honestly, I don’t know. I hope you get to back up too. That’s honestly the most fun if you go get to back up I’ve been told. Tom Smith: I mean the jackknifing of backing up something that you’re trying to tow is just a party. Christian Seabaugh: Yeah. So that’s a good way of putting it. Christian Seabaugh: No, it’s all cool. Tom Smith: On the ride and drive and tow, I didn’t even know that was a thing. Christian Seabaugh: Yeah. And there’s also, a Jeep off-road kinda course that you can take a Wrangler or a Cherokee or a Compass out on their little off-road course. It’s kinda cool. Tom Smith: Now, do I remember doing the podcast with John earlier, that there’s an off-road indoor? Tom Smith: Where is that? Christian Seabaugh: It’s off over in that way. Christian Seabaugh: Different room, yes. Christian Seabaugh: But it’s super cool, you can climb… do a little hill climb, you can pick your wheel up in the air at some point. Tom Smith: But I’m not driving that, right, I’m being driven? Christian Seabaugh: I believe so, yes. Which is a shame, if you ask me, but yeah I understand the reasons why. Tom Smith: I could imagine. Yeah, I could imagine there might be some insurance issues, just minor ones. Christian Seabaugh: Yeah. Just a little. Tom Smith: Alright. Well, fantastic. Christian, anything else to add, any other advice for those coming to the show? It’s gonna be… it’s gonna come and go so quick, right? Tom Smith: Are you gonna be here the whole time? Christian Seabaugh: I will be here all day today, but I won’t be here the whole time, unfortunately. Christian Seabaugh: It’s worth checking out the, our Best Driver’s car display we have I believe, seven of our twelve contenders here. Tom Smith: You’re Best Drivers? Christian Seabaugh: Best Drivers’ car. So, every year we get twelve of the world’s greatest super and sports cars in one room, or sorry not a room, but on one track and one road and Best Drivers of the Year, we hash out which one’s the best. Tom Smith: So, these are supercars, these are hypercars, these are … what are these? Tom Smith: You’re really grouping in an odd … just from a price point perspective, I mean you’re talking about 100s, 100 plus thousand-dollar swing there. Christian Seabaugh: Yeah, absolutely. It’s the best drivers car and best I can afford with 30,000 dollars. We do those kinds of tests too obviously. Tom Smith: I like that. That’s cool. Christian Seabaugh: But, Best Drivers car is no holds bar, if you had to take a good car on a good road, what would you take? This year it was the Huracan Performante. Christian Seabaugh: But, to be fair, cheaper cars have won in the past. Tom Smith: Yeah. Well, I mean, just the fact that you’re grouping them together and considering them along the same, in the same category, right? Christian Seabaugh: Yeah. I mean, the most impressive thing to was that I think the Civic Type R finished fourth this year. It beat out Aston Martin Vantage, it beat out the Mustang GT, beat out Corvette ZR1. Tom Smith: That’s big. Has that been published? Christian Seabaugh: Yes, it’s in our November issue. Christian Seabaugh: Yeah on newsstands now. Tom Smith: So, it’s… okay. Christian Seabaugh: And online. You can watch our videos with it too. Tom Smith: I know a Honda dealer that will be happy to display that proudly in their showroom. Tom Smith: That is a big, a big feat. Tom Smith: Now, these are cars… we get to go on these rides? Christian Seabaugh: No, you don’t get to get on the rides, but you do get a look around the car. Tom Smith: You can check out the cars all next week? Christian Seabaugh: Absolutely. And they’re cars that are pretty rare on the auto show circuit. Christian Seabaugh: Obviously, aside from the Civic Type R and the Mustang GT. Tom Smith: Right, right. Alright. What other pointers do you have for anybody coming? Christian Seabaugh: Worth checking out all the electric vehicles here. I mean, there’s kinda something for everybody in that space as you probably well know. Unique here is the Audi e-tron, which is I believe the first in North America. Christian Seabaugh: And that’s super cool in that it’s an electric SUV that doesn’t necessarily look like an electric SUV. So it doesn’t look like a Tesla Model X with its kind of ridiculous roofline and everything. It looks like a normal, average, everyday SUV, which is cool. Christian Seabaugh: It’s brand new. Tom Smith: High tech car as well? Christian Seabaugh: High tech, yeah. It’s got a, I believe 250 miles of range, thereabouts, 402 horsepower, has off-road mode, it has Audi’s semi-autonomous technology in it. It’s super cool. I haven’t driven it yet, but it looks very promising. Tom Smith: This brings me back to you really quick, as before we wrap this up. What’s your favorite thing about your gig? Christian Seabaugh: Getting to make ridiculous stories happen, in all honesty. Whether that be with station wagons or supercars, it’s just the fact that I can think of something that’s silly and make it happen and people enjoy reading about it or watching it is super rewarding to me. Tom Smith: Do you fancy yourself a car guy? Christian Seabaugh: Oh, absolutely, yeah. Tom Smith: Did you before you got into this? Christian Seabaugh: Oh, yeah. I was always into cars. Tom Smith: A happy, little love affair of a career. Christian Seabaugh: Absolutely, yeah. Yeah, I fell into journalism as a major in college, ended up liking it and I distinctly remember, I needed a senior project and I was like, the easiest thing for me to possibly do would be to write about cars. So that’s what I did, path with least resistance and look where I am today. Tom Smith: There you go. Do what you love and have fun doing it. Tom Smith: Of Motor Trend, features editor of Motor Trend, thank you so much for joining me. Thanks for putting on a little shindig here, known as the OC Auto Show. I know a lot of people are gonna be coming, many of which listening to the iDriveSoCal podcast. So thanks for coming on. Christian Seabaugh: Thanks for having me. Tom Smith: And we look forward to doing it again. Tom Smith: For iDriveSoCal, I am Tom Smith. Thank you as always for tuning in.